A campaign urging people with a persistent cough to see their doctor has led to a "dramatic rise" in lung cancer diagnoses, figures show. The campaign, which ran in England last year, said people should go to their GP if they had had a cough for more than three weeks. An estimated 700 extra patients were diagnosed with lung cancer around the time of the campaign. Public Health England's Be Clear On Cancer campaign, supported by Cancer Research UK, NHS England and the Department of Health, ran in May and June 2012. The number of people diagnosed with lung cancer in May-July 2012 was 8,335 - just over 9% higher than the 7,639 in the same period in 2011. And around 400 more patients had their lung cancer picked up at an early stage, improving their chances of survival. Surgery, which improves the chances of surviving the disease, was offered to 300 more patients than in 2011. Dr Harpal Kumar, chief executive of Cancer Research UK, said: "It is great news that this campaign has raised awareness of lung cancer symptoms among those most at risk of the disease. "By acting quickly if you notice a possible symptom, you can give yourself the best chance of survival. "In many cases it won't be cancer, but it is better to be sure and, if it is cancer, to detect it earlier rather than later." Sean Duffy, national clinical director for cancer at NHS England, said: "Until recently a lung cancer patient in Sweden was nearly 70% more likely to survive their disease for at least five years than if they lived in England. "So I am therefore delighted that this new set of figures shows that the Be Clear On Cancer campaign has helped speed up our progress in lung cancer survival, with hundreds of patients receiving potentially life-saving surgery as a result of this campaign." It is hoped the campaign will run again next year. 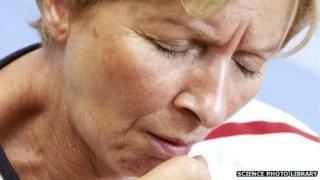 Dr Penny Woods, chief executive of the British Lung Foundation, said the initial results from the campaign were "encouraging". But she added: "Naturally, we won't know for sure until subsequent years whether this impact will be a lasting one. But these very positive early indications seem to confirm that such awareness campaigns can make real tangible differences to people's lives." She added: "The findings tentatively suggest that we might finally be turning a corner in tackling a disease that has been killing too many for too long."